This 12-day Costa Rica adventure takes you to the nation’s top biodiversity hotspots. Along the way, you’ll dip your feet in cold rivers, track resplendent quetzals at dawn, and listen for the calls of howler monkeys set to a backdrop of smoking volcanoes, thick jungle and sandy beaches. This itinerary is specifically tuned for wildlife lovers. Expect to get up early and stay out late to see monkeys, lizards, birds, insects and other spectacular fauna that inhabit the virgin rainforest, cloud forest and swampy estuaries covered here. 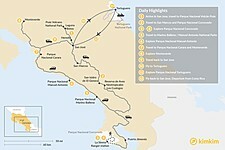 The trip begins with a southwest journey from San José to Parque Nacional Corcovado (Corcovado National Park) before continuing northwest along the Pacific coast. Next head inland to the cloud forests around Monteverde and complete the trip along the Caribbean coast at Parque Nacional Tortuguero (Tortuguero National Park), accessible by a short flight. Wildlife spotting sometimes requires rigorous jungle walking, so be prepared with the proper gear. While some swear by rubber boots for jungle trekking, consider also just going with a light pair of running shoes you don’t mind getting soaked. Long sleeve light shirts and pants that dry out quickly are essential for insect and sun protection. Also pack a rain jacket, bug spray, sunscreen, hat, sunglasses, binoculars, and a good camera with zoom lens. The long-tailed quetzal bird can be spotted at Parque Nacional Volcán Poás. Costa Rica's capital San José isn’t without its charms, but to get a little closer to nature, travel 8 miles north to the area around Heredia, a university town with a relaxed student vibe. A variety of hotels are available here, from budget to upscale. You’ll need to fight off the jetlag from the long flight, so get outdoors for most of the day. An easy excursion from Heredia or San José takes you to Parque Nacional Volcán Poás (Poás Volcano National Park). Take a 30-minute hike to Laguna Botos for the chance to see some of the park’s approximately 70 bird species, including quetzal, emerald toucanet, and black guan. You may also see some frogs and snakes in this small dwarf forest below the active Volcan Poás, which last erupted in mid-2017. The trip to Corcovado from San José is a pleasure in itself. You can save some money by taking a public bus to Puerto Jimenéz, alternatively, hire a private taxi and take as many stops as you wish. Renting a car is a final option for those with a sense of adventure and at least a little Spanish (for asking directions). Begin by heading through the rolling verdant hills of coffee country. Up above you in the Cordillera de Talamanca looms Costa Rica's highest peak in Parque Nacional Chirripó (Chirripó National Park). Keep your eyes open for coffee plantation and fruit farm stops in San Marcos de Terrazú and San Isidro de El General. Another possible stop is Reserva de Aves Neotropicales Los Cusingos (Los Cusingos Neotropical Bird Reserve), known for its excellent birding. From there it's on to the Osa Peninsula and Parque Nacional Corcovado. 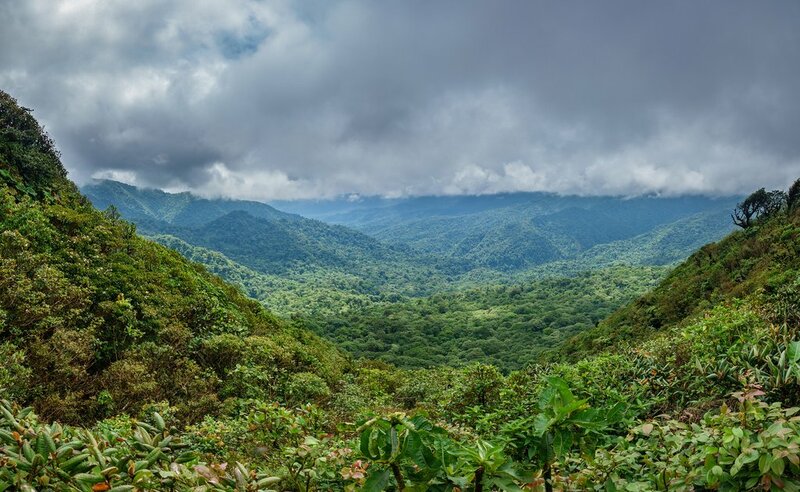 This is the largest stand of virgin rainforest in Central America. For accommodation, you can choose between basic pensions in Puerto Jimenéz or upscale lodges. In the park, you will camp of stay in a bunkhouse. The rainforest comes alive after dark so consider a night tour, with great chances of seeing snakes and other odd night crawlers. Get up just before dawn for the hike along the beach to the Sirena Ranger Station the next day. 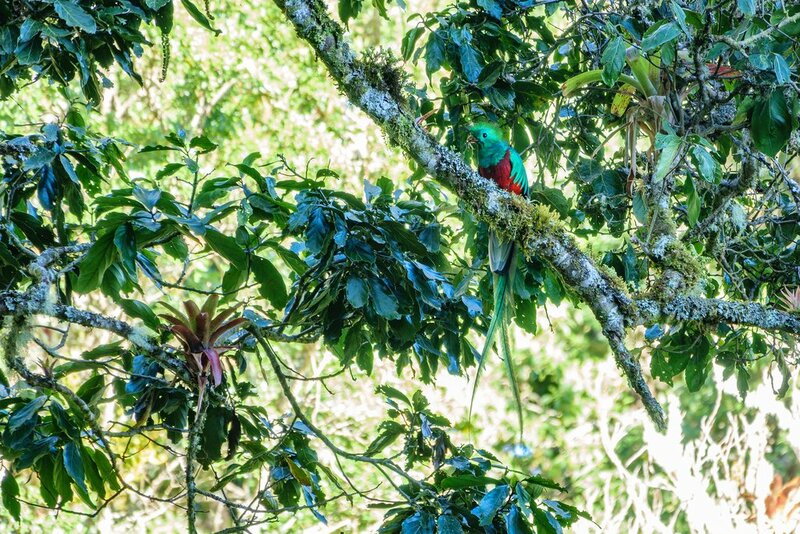 Along the walk, you are likely to see Costa Rica’s largest populations of scarlet macaw. Watch yourself on the river crossing though, as hammerhead shark are known to ply these waters. From La Sirena Ranger station you have two options. Numero uno: Take a number of shorter hikes around the station, looking for tapir, anteater, harpy eagles, Jesus lizards and more. The more adventurous option two takes you straight through the center of the park. Expect to see any number of wild animals (the lines of leaf-cutter ants are particularly entertaining, but if you’re really lucky, or have a really good guide, you might just see a jaguar). In any of these national parks, a naturalist guide is key. They know how and where to look for animals, they can identify plants, and keep you from getting lost in the middle of nowhere. Beach at Uvita, break here for snorkeling or a boat trip. Reverse course back up the coast, this time taking the coastal road for a quick stop at Uvita. The best way here is by rental car or private taxi. Alternately, you would need to take public transit, with at least one switch in between. 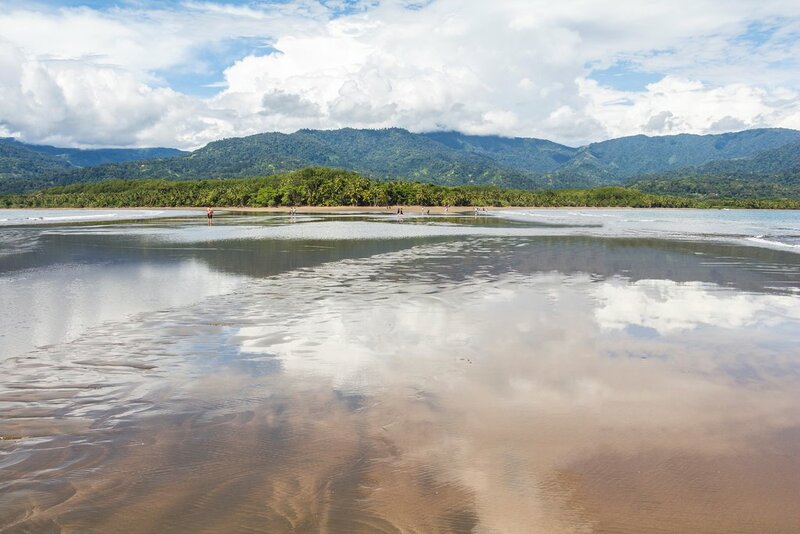 With enough time, you can stop here for lunch and a quick snorkel or boat trip in the Parque Nacional Marino Ballena (Marino Ballena National Park), where you can spot dolphins, migrating whales and the occasional sea turtle. 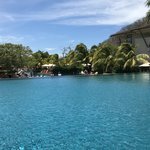 Continue northwest along the coast, ending your day with dinner and a sunset cocktail at a resort outside of Parque Nacional Manuel Antonio (Manuel Antonio National Park). The area is home to excellent resorts with views of the sea, plus a few budget hotels. Costa Rica’s smallest national park gets awfully crowded, so get up at dawn to beat the crowds (the bird watching is better at this time anyway). As you walk through the clearly marked trails, keep your eyes peeled and ears open for troops of raucous monkeys. 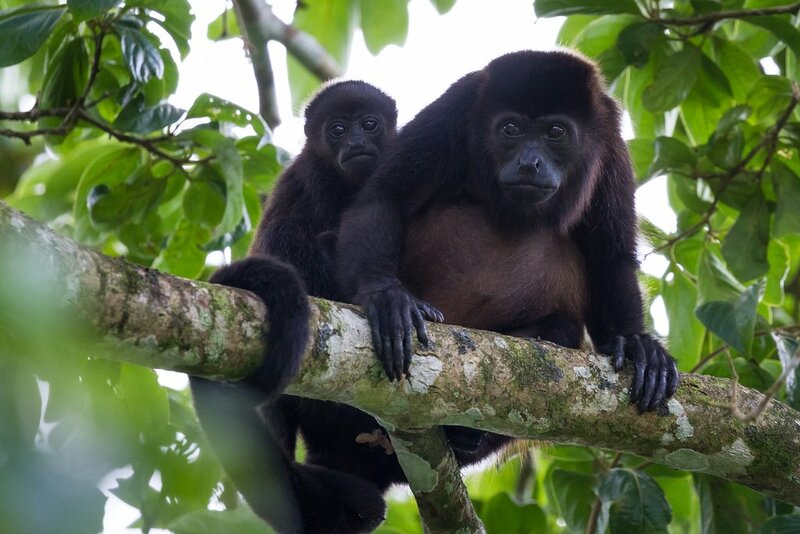 The park is home to all four of Costa Rica’s monkey species, including capuchin, squirrel, howler and spider monkey. Pack a pair of binoculars for bird watching, the park has over 180 bird species. Other possibilities include coatis, sloths, and iguanas. It’s another long day drive up to Monteverde. If you get up early enough, you can make a pit stop on the coast in Parque Nacional Carara (Carara National Park) for great birding and some snapshots of crocodiles over the Tarcoles River Bridge. From there you’ll start climbing into the high cloud forest of Monteverde. Around sunset, check out either the bat jungle or serpentarium for a closer look at these oft-maligned but essential jungle species. Accommodation includes eco-lodges and a few budget stays. 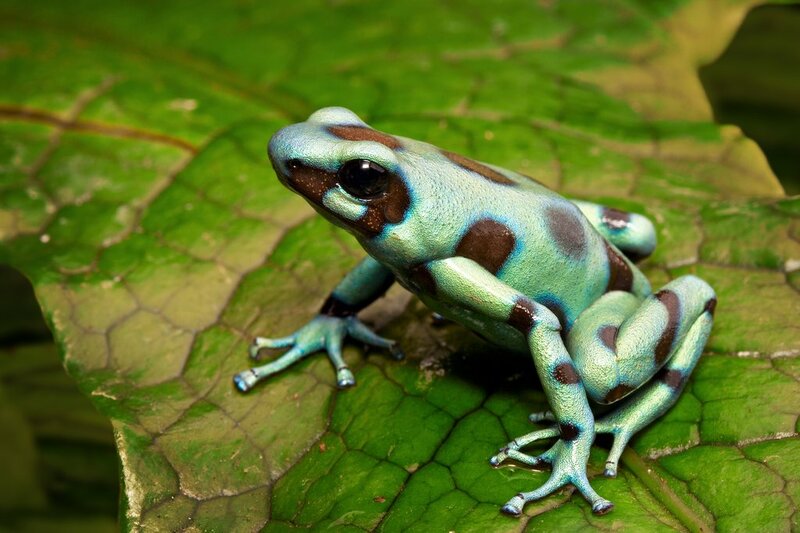 Green poison dart frog, one creature you may encounter at Monteverde. Get up at dawn for a quick walk through the silent cloud forest and a delightfully lyrical visit to the butterfly farm. Here under the sheltering canopy, you have the option to see any number of cloud forest dwellers, including over 100 species of mammal, jungle cats, deer, tapir, and sloths. If you didn’t get enough frogs the night before, keep your eyes on the ground for glimpses at the 1,200 reptiles and amphibians that live here, including the beautifully colored - but very toxic - poison dart frog. The real highlight of the day is taking to the sky for a canopy tour. 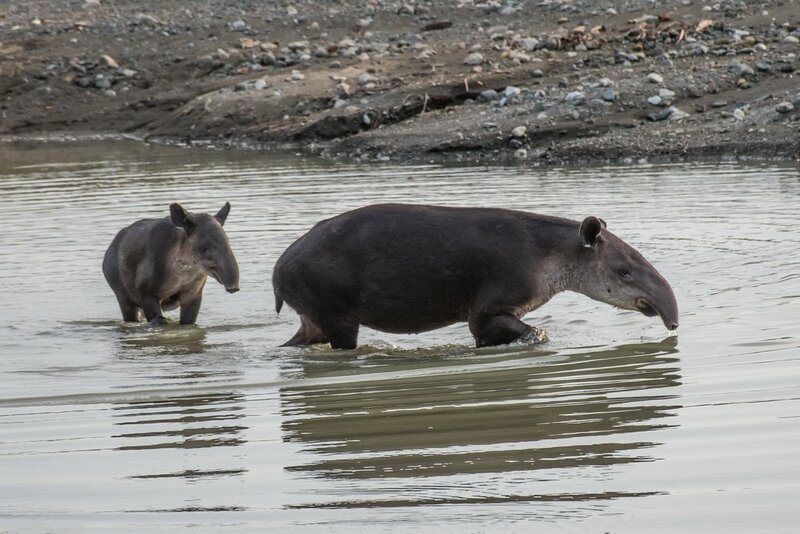 The best wildlife watching is had on the walking canopy tours, while the zip lines will give you an exhilarating ride, but less proximity to the unique ecosystems of the canopy. Turtle coming ashore to lay eggs at Parque Nacional Tortuguero. After Monteverde, travel back to San José by land. 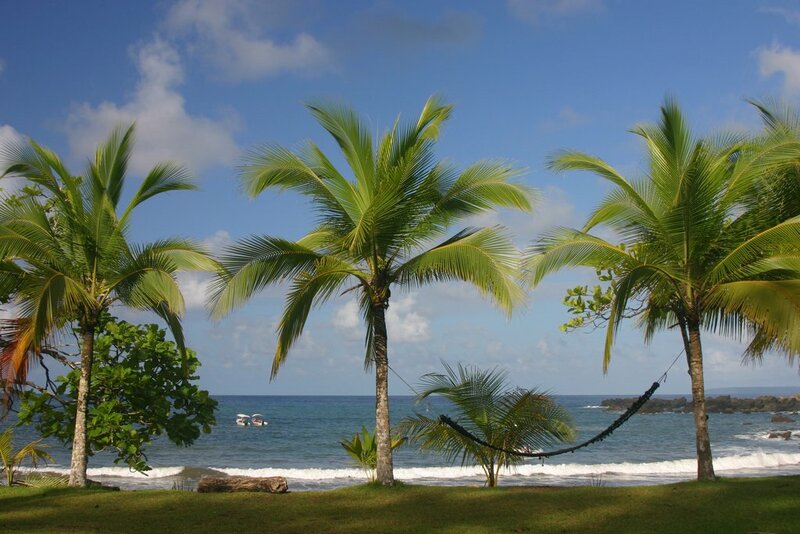 You may need to stay the night near San José to catch a flight the next day to Tortuguero (consider Escazú just outside San José for a little more relaxation). In the afternoon, you can take a bird-watching excursion in nearby Parque Nacional Braulio Carrillo. (Braulio Carrillo National Park) From there, it’s a quick flight over to the road-less Parque Nacional Tortuguero. Located on the Caribbean Coast, this massive rainforest is the best place to see nesting sea turtles in all of Costa Rica. 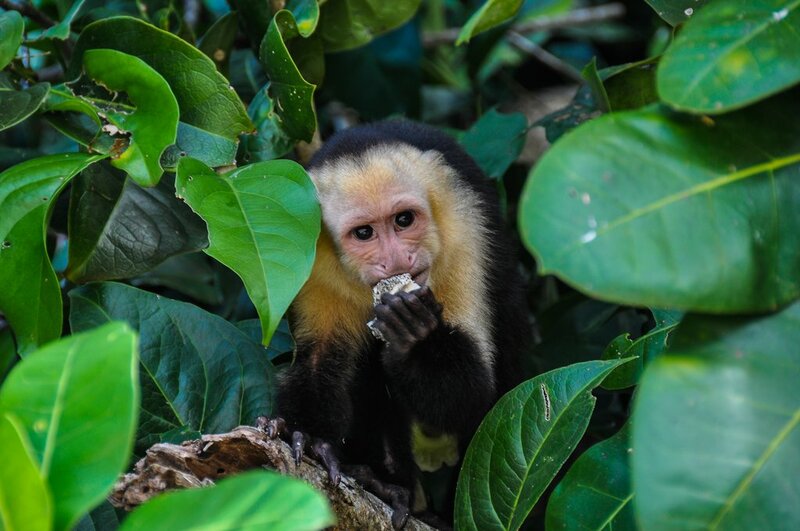 The riverine park is home to monkeys, caimans and more. You can stay in high-end eco-lodges, or more affordable bed-and breakfasts and cabins. The key to enjoying your stay here is mixing up your excursions. On night one, head out for a jungle boat tour (boa constrictor sightings are possible). During daylight hours try a silent canoe trip the first day, then a motorized boat excursion the next. 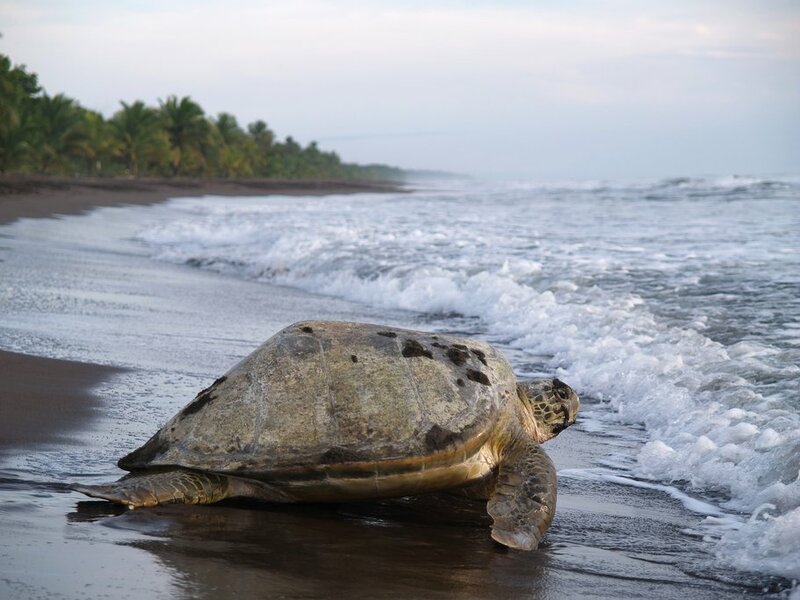 The highlight of Parque Nacional Tortuguero is a night out watching turtles come to shore to lay eggs (or if you’re even luckier you might get to witness a hatching event). You may see green sea turtles, leatherback or hawksbill here. The turtle season generally runs July to October. 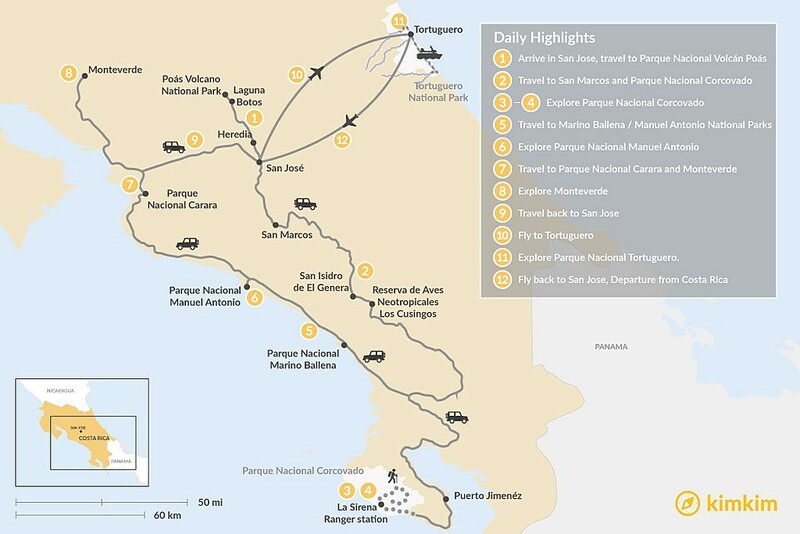 Complete your trip with a flight back to San José.